Check out that hair! Dress from Ebay. Bob's and my anniversary is April 22. 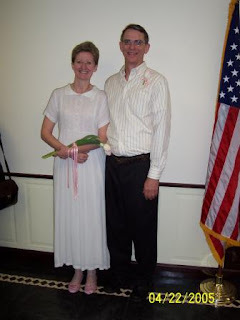 We got married in the City Hall in NYC, and had maybe ten people attending our wedding. We got everyone tickets to see Dirty Rotten Scoundrels and had dinner at The Muse. This year our anniversary is on a Monday. I suppose we'll either celebrate on Sunday or we'll wait till Rolex (I'm in favor of the latter). On a daily basis we fuss at each other alot. Bob hates that I use dish soap -- ever. Honestly I'm not sure why we even have it. I hate using "rags" instead of sponges and can barely stand to touch the limp, damp bacteria-laden pieces of cloth he uses to clean our dishes and utensils. We have diverging opinions about kitchen management in general. Neither of us is particularly easy to be around, at least not 24/7. When you marry late in life you bring a lot of baggage -- not just emotional stuff but a lifetime of habits and idiosyncracies. Our cranky conversations about home economics are not what I think of when reflecting on our years together. What do I think about? I think of how Bob talks to Riley and our cats in a peculiar Bob-created language that consists of about thirty words -- for example, "Fooser" means face, and "OdieOdieOdie" is what is spoken while patting the head or nose. I think about how much he loves the horses. How he never brings up the money I spend on them, except as a vague reference to my "fixed overhead." I think about how much he dotes on and supports his sons. I think about how he handles everything related to the house, from bills to generators to snowblowers. I think about how nice it is to come home to him, how he makes me laugh, and how I rely on his advice in personal matters over the years. I think about the unflinching honesty in his feedback. I don't know what Bob thinks about. I hope it is nothing bad. Every so often we jokingly "rate" our marriage on a scale from 1-10, and the number is usually "7." I think that's a pretty good number, all things considered. So tonight, I'm raising a glass to the number 7 and hoping for many more. Happy Anniversary! Bill and I got married on April 22, 2000. It is snowing bit today and did the same 13 years ago. I hope you both have a great day, too. I did comment earlier but I think I was foiled by the "check your not a robot" words, even when I put it onto audio it just said Brrrrum Brrrrrum. Anyway, happy Anniversary and I agree totally about dish cloths, grim things!! Your post is so sweet It made me teary-eyed. Happy anniversary to you both! Agree on the dishrag thing--I remember reading a short story once--a horror story, if I remember correctly--about the dark skies being "a dishrag gray." Scary! As for your anniversary, contratulations, best wishes, and may you have many MANY more! And relating to your various and sundry "discussions," it is good that you are both strong people. I could imagine nothing worse than having one "head of the family" with the remaining spouse saying, "Yes dear, yes dear, yes dear" and never having any sort of give-and-take. I think your discussions and the give-and-take are what make your marriage strong. Seven is a very good number. Congratulations and happy anniversary. It sounds as if your marriage is cloaked in gratitude, and that will trump the occasional bickering over dishes every time. Oh - and here's a tip for you: vinegar! I read that the kitchen sponge has more bacteria than a toilet seat. (lovely). So we always soak the sponge -let it live in - a jar of vinegar when it is off duty. Vinegar kills the bacteria and it isn't harmful to people. Perhaps if you do this Bob will not mind the sponge so much. And how about this: Let Bob wash with his cloth; you wash with sponge. Everyone is happy and the dishes get done! Dish cloths are not worth discussion or discord. Pour a kettle of boiling water over dish cloths and sponges. Hang them over the sink to drain and dry. I got that from my 1895 household encyclopedia. It's a gold mine of useful tips.